There are vast behavioral gaps between the educated upper tribe (20 percent of the country) and the lower tribe (30 percent of the country) . . . Roughly 7 percent of the white kids in the upper tribe are born out of wedlock, compared with roughly 45 percent of the kids in the lower tribe. In the upper tribe, nearly every man aged 30 to 49 is in the labor force. In the lower tribe, men in their prime working ages have been steadily dropping out of the labor force, in good times and bad. People in the lower tribe are much less likely to get married, less likely to go to church, less likely to be active in their communities, more likely to watch TV excessively, more likely to be obese. The NY Times followed up with a story about the achievement gap growing between rich and poor students in the United States. The article was based largely on two chapters from a book that was released last fall by the Russell Sage Foundation (which, as I've previously mentioned, I highly recommend). In one chapter, Sean Reardon from Stanford finds that "the achievement gap between children from high- and low-income families is roughly 30 to 40 percent larger among children born in 2001 than among those born twenty-five years earlier" and that the gap between students from families in the 90th and 10th percentiles of income is now "nearly twice as large" as the gap between blacks and whites (the opposite was true 50 years ago). Since I've spent my entire post-college life either trying to teach low-income students or researching low-income students, the chapter jumped out at me when I first saw a preview of it last summer. 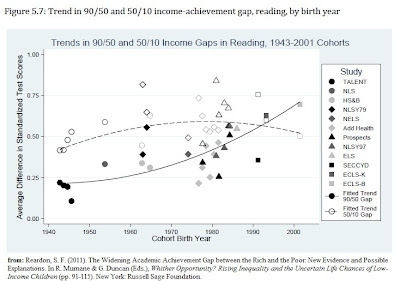 The fact that the achievement gap between rich and poor was actually growing (while the black-white achievement gap has essentially plateaued the past 20 years), jibed with what I've read about, and seen in, both our schools and our society. But then, when I was preparing to discuss the chapter with my students last fall, I took a closer look at the trends. And this is what I discovered: the real growth in the gap between rich and poor isn't actually between the richest and the poorest, it's between the richest and those in the middle. I've pasted one chart from the Reardon chapter to show what I mean. The gap between those at the 50th percentile and those at the 10th percentile -- the middle-poor gap, if you will (represented by the dashed line) has been fairly steady. 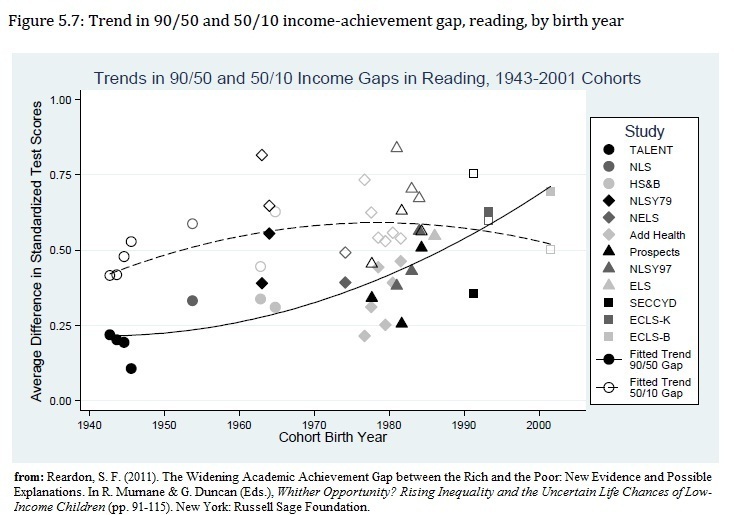 The gap between those at the 90th percentile and those at the 10th percentile, meanwhile -- the rich-middle gap, if you will (represented by the solid line) -- has grown rapidly, from under a quarter of a standard deviation for children born in the 1940's to almost three-quarters of a standard deviation for children born in the 21st century. I actually missed that point when I first skimmed the chapter, but to me it's maybe the most pressing policy issue of the next few decades: how will middle-income Americans work and live? As somebody who studies the effects of poverty, I'm pre-disposed to believe that poverty, and the low performance of children living in poverty, poses the largest educational problem. And there's no doubt that that problem is large. Even if the poorest kids aren't falling further behind the middle-income students, they're still far behind where they ought to be and farther behind the wealthiest kids than before. But if the middle of the income distribution falls far behind as well, that could leave us in really serious trouble. This chart of wage growth that EPI offered in response to Brooks' op-ed is one way of looking at the issue. The wages of the working poor are awful, but it's the hourly wages of the middle-income folks that have seen the lowest growth in the last 20 years. Indeed, the median household made only slightly more in 2010 than it did in 1978 ($49K vs. $46K -- Table H-6) when adjusting for inflation. As the table below indicates, from 1991-2010, median income by education level declined considerably for the nearly 60% of the population with a high school diploma, some college, or an associates degree, held steady for the 20% or so with a bachelor's degree and increased for the 10% or so with a master's or professional degree (to reduce visual clutter, I leave off the 13% or so of Americans who did not reach, or did graduate from, high school and the 1% who earned a doctorate degree*). Now, education levels increased a bit during the time -- so part of the explanation may be that there were more people in each of the higher groups -- but not by enough to change the fact that Americans with median levels of education are earning less now than they were 20 years ago. It's hard to imagine a burgeoning economy in any country that sees no real income growth for those at the middle of the income distribution. But Murray, Brooks, and others (including liberals as well) also note other worrying trends concerning health, marriage, childbirth, etc. Indeed, another recent NY Times article reported that the majority of babies born to women under 30 are now born out of wedlock. But more important are the different rates by social class: "About 92 percent of college-educated women are married when they give birth, compared with 62 percent of women with some post-secondary schooling and 43 percent of women with a high school diploma or less". And while the number of babies born out of wedlock has risen for all three groups, it's the middle group that's seen the starkest increase: in 1990 only 11% of children born to women in their 20's with some college were born out of wedlock, but by 2009 that number had more than tripled to 34%. Again, the problem is more pervasive among the least-educated women (the comparable number is 51%), but the largest change is in the middle of the income distribution. Now, you may have noticed that I titled the post "Median Class" instead of "Middle Class," and that's because what a lot of people define as "middle class" isn't actually comprised of people in the middle of the income distribution. People often talk about college-educated adults belonging to the middle class, but fewer than 30% of adults have a 4-year degree. Depending on which model of social class one uses, those in the middle of the income distribution (those who fall right around median) are usually classified as lower-middle-class or working class. And I want to be clear that I'm talking about those who fall right around the median of the income distribution. It seems to me that a large part of the challenge is economic. Jobs that pay high wages to employees without high levels of educational attainment are fast disappearing (one could write "high wage/low skill" jobs as shorthand, but I don't possess the skills for most of these jobs so that seems inaccurate to me). We still have a not-insignificant number of jobs in construction, trucking, the trades, manufacturing, and so forth that pay fairly well, but the number of those types of jobs has declined dramatically -- largely due to globalization and/or technology -- in recent decades. And it seems unlikely that this trend will dramatically reverse. In other words, it seems unrealistic to expect anywhere near 70% of the population to find stable employment with decent wages without a 4-year degree. 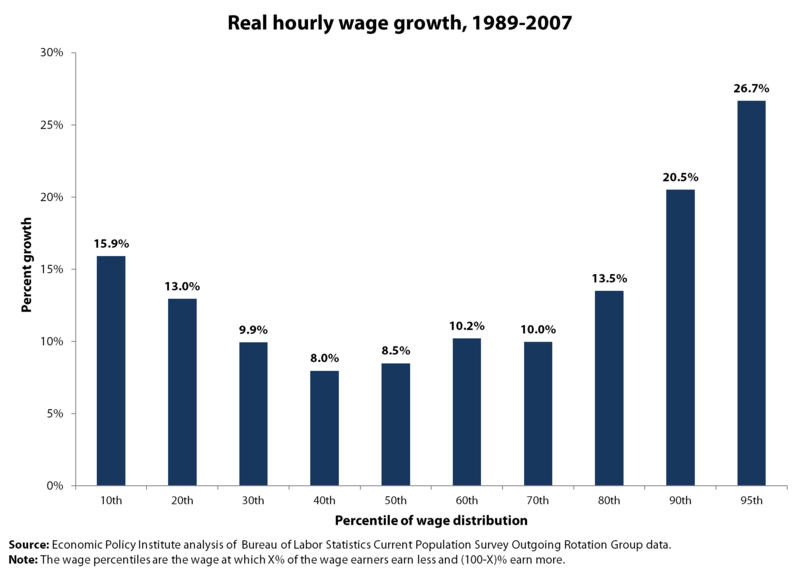 The result, it seems to me, is that instability and low wages are no longer the domain of only the poorest Americans. And it seems reasonable to assume that the growth in the rich-middle achievement gap is due, at least in part, to the spread of this job instability to the median earners. In short, it seems like there's a growing bulge in the middle of the income and education distributions that is lost. Fewer and fewer can make a good living without a college degree. They're falling further behind the wealthy academically. And to make matters worse (to be intentionally and melodramatically blunt), recent reports say they're increasingly divorced, fat, and lazy as well. 3.) reverse social trends and encourage more two-parent households, more civic engagement, less obesity, etc. But I hope I'm wrong. I hope 20 years from now I'm writing about the resurgence of the median class and not about the spread of poverty to children of middle-income households. Either way, I think recent data indicate we need to adjust our focus when we discuss ways to boost performance of the lowest achievers. If we want to focus research and policy on those lagging behind, we need to broaden our scope beyond just the 10 or 20% lowest-income Americans. Those in the middle aren't doing that much better. 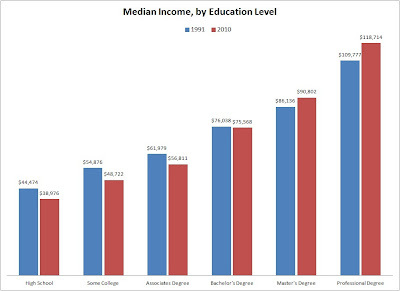 *median income increased slightly from 1991-2010 for those with less than a 9th grade education -- from $20,640 to $21,254, decreased from $27,375 to $24,787 for those who attended, but did not graduate from, high school, and also slightly decreased for those with a doctorate as well -- from $121,693 to $119,825. The median earnings of college graduates in 1991 and 2010 seems to undercut the Lumina Foundation and Anthony Carnevale at Georgetown, who claim there is a great looming shortage of college graduates. If there is such a shortage, shouldn't wages be going up, and shouldn't the graduates of Drew be doing better in the labor market? How low will college graduate's wages go if we reach that 60% college completion goal? 1.) In 1991, 21.4% of adults 25 and older had a bachelor's degree. In 2010, that statistic was 29.9%. 2.) I can't seem to find the exact numbers at the moment, but the number with a master's, professional, or doctorate degree also grew -- to 10% in 2010 (meaning 1/3 of those with bachelor's degrees also had another degree -- the median salaries you see in the table would be for the 2/3 who have a bachelor's but do not have a higher degree. 3.) In 1991, the median salary for those with bachelor's degrees was $14K higher than those with associate's degrees, $21K higher than those with some college, and $32K higher than HS grads. In 2010, those figures grew to $19K, $27K, and $37K. So, despite the fact that the pool of people with bachelor's degrees grew by almost 50%, and that there were more people with more than a bachelor's degree above them, those with bachelor's degrees earned quite a bit more relative to less-educated adults. You ask how low the wages of those with bachelor's degrees can fall if that population doubled . . . well, at the current rates, they might fall a little bit in absolute terms but seem likely to increase dramatically in relative terms. I'm not a labor economist, so I'm not going to speculate on how many jobs will exist for those with bachelor's degrees in the future, but the trends look far worse for those without them.